Looking for the Nikon P1000 vs Nikon P900 comparison? Both cameras has the same 1-inch type image sensor, but let’s see which one is better for the money. 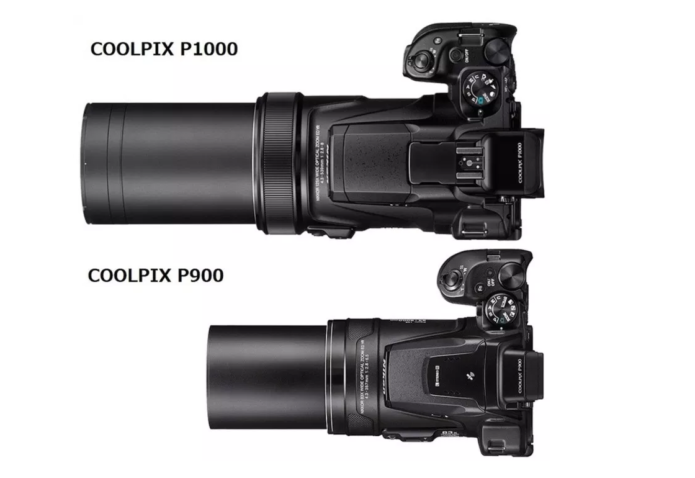 Both the P1000 and the P900 are fixed lens compact cameras that are equipped with a 1/2.3-inch sensor. Nikon Coolpix P1000 brings the telephoto end up to a massive zoom range of 24-3000mm. This amazing superzoom camera features 125x optical zoom and 16 Megapixel sensor with ISO sensitivity up to ISO 6400. Nikon P1000 can shoot video footage at 4K/30p, while the P900 is limited to 1080/60p. The camera also gives you full RAW support. Take a look specification comparison of Nikon P1000 vs Nikon P900 camera. The table below summarizes the key physical specs of the two cameras. Let’a talk about the additional difference between the two cameras. Nikon Coolpix P1000 is 5% (6.8 mm) wider and 15% (15.6 mm) taller than Nikon Coolpix P900. Nikon Coolpix P1000 is 32% (43.9 mm) thicker than Nikon Coolpix P900. Nikon Coolpix P1000 [1415 g] weights 57% (516 grams) more than Nikon Coolpix P900 [899 g] (*inc. batteries and memory card). The side-by-side display below illustrates the physical size and weight of the Nikon P1000 and the Nikon P900.